Hi all! This post will explain how the process to exchange your old food/milk/vitamins for new ones will work. The exchange process begins on Dec. 31, 2016. To clarify, the food/milk/vitamins are considered "OLD" if they were purchased or acquired from collection packs prior to October 4, 2016. This food will expire after December 31, 2016. This is due to a change we made in the scripting for our food and other consumables. If you purchased NEW food/milk/vitamins after October 4, 2016, then those are fine and they will not expire. If you are still unsure, schedule an appointment anyway and staff will assist you. 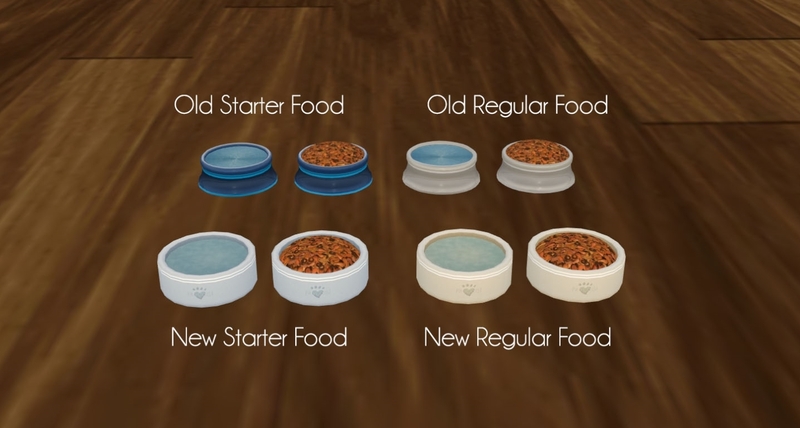 I cannot exchange owner-only starter food. The food must have the "Any" option in the menu for it to be exchangeable. This exchange has to be processed manually by our staff via appointment. To schedule an exchange, please contact Kitten Longmeadow directly in world to discuss days and times when you are available. Most of the time Kitten can accommodate you immediately, depending on how many items you have to exchange (ie. the more items you need to exchange, the longer the process will take). Please read these instructions carefully in order to help expedite the exchange process. 1. Gather the items you are exchanging into your inventory. We suggesting organizing them into separate folders so you can find them easily. 2. Reduce your attachments as much as possible. Please arrive to your appointment on time. Please be prepared to follow all staff instructions during your appointment. The appointment can last approx. 30min or longer depending on how many items you have to exchange and you must be present through the entire process unless directed otherwise. If you have a lot of items to exchange, be advised that we may run out of time during the appointment to exchange everything. If this happens, staff will coordinate scheduling another appointment with you to exchange the rest of your items. 1. Follow all staff instructions. Please wait for staff to give you direction before rezzing or clicking anything. 3. Vitamins - Staff will direct you to rez your vitamins and click to apply them to a dummy object rezzed at the location. The converter will immediately exchange your old vitamins for new ones. 4. Portable food - Staff will give you a dummy object that you need to attach to yourself. You will then attach your portable food to yourself. If you have a lot of portable food, you will need to attach them in batches of 10+. The dummy object will consume the portable food. Wait for staff to give you instruction before attaching/detaching. If you have any questions regarding the exchange, please contact Kitten Longmeadow before your appointment. Will there be someone else doing this as well for those who are on during the evening? AKA, after the time of 5:00PM SLT? (01-02-2017 06:54 PM)TasiaAmberRaeNaylise Resident Wrote: [ -> ] Will there be someone else doing this as well for those who are on during the evening? AKA, after the time of 5:00PM SLT? Unfortunately, no. If people need to make special arrangements they should contact me directly so we can work out a time for them. Thank you for making this such a smooth process, Kitten! Is there a deadline? I wanted to wait until it was not too busy which I thought it might be at first and then with the server issues, I thought I'd wait until that kinda settled down too. So I was wondering if I could still wait a couple of weeks or if there was a deadline? I have an appointment for Sunday, Feb. 5th, at 330 and I need to reschedule it please. It won't let me get to it too take it off. (02-02-2017 04:30 PM)Kayla Woodrunner Wrote: [ -> ] Is there a deadline? I wanted to wait until it was not too busy which I thought it might be at first and then with the server issues, I thought I'd wait until that kinda settled down too. So I was wondering if I could still wait a couple of weeks or if there was a deadline? There's no deadline. I expect I'll be doing this for a long while. Just make an appointment when you're ready. If there are no times available, message me in-world to set up a time. Cool, I'll just wait until everything settles down then. Yes, I have been waiting for KC to finish cleaning up from the server outage. No sense bothering them when they are not even able to finish that repair yet. (02-07-2017 11:39 PM)Oselkhandro Resident Wrote: [ -> ] Yes, I have been waiting for KC to finish cleaning up from the server outage. No sense bothering them when they are not even able to finish that repair yet. I appreciate the concern, but I am able to multi-task while conducting a food exchange so feel free to schedule your appointment at your convenience. Thanks.